Important Note: The Wahoo TICKR only transmits accurate R-R intervals for use with HRV measurements via Bluetooth only. 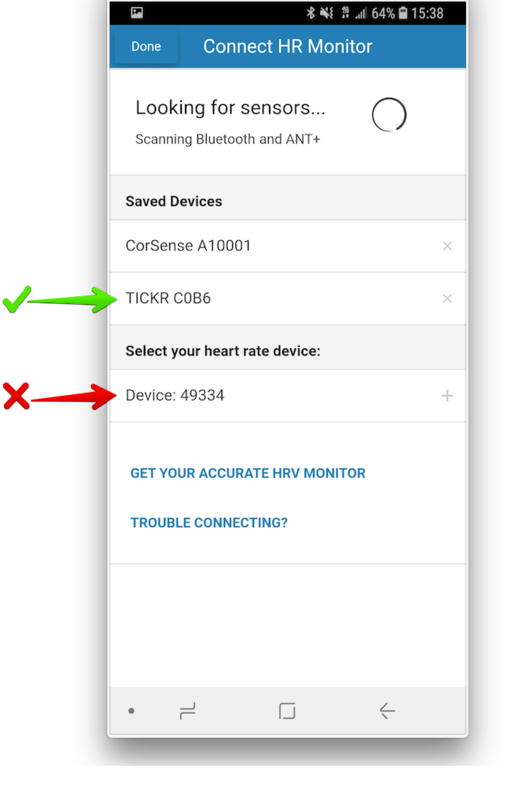 Do not use the ANT+ feature of the Wahoo TICKR with Elite HRV. When connecting the Wahoo TICKR, select the device with a name like "TICKR 1234" (the 1234 will be unique to your device). Do not select the device with a generic name like "Device: 12345". The TICKR sometimes switches to the ANT+ connection, so you may need to remove/re-save it. Additional background: After putting on the TICKR, it will stop sending signals out after a small amount of time if you haven't connected it. You may need to take the monitor off and put it back on to restart it sending signals. Hope this helps! See below for additional troubleshooting tips (recently updated! ).